Children's Worship Bulletins can be used to create relevant, scriptural and educational Sunday school activities about grace. You can be confident that each bulletin is theologically and educationally sound because they're based on familiar Bible passages. In addition, an educational specialist reviews every bulletin. The messages are basic and teaching is clear and simple making it easy to adapt to your Sunday school activity requirements. Children's Worship Bulletins can be used to create Sunday school activities about grace for both your preschool and early elementary classes. Each bulletin comes in two versions — one for ages 3-6 and one for ages 7-12. The dot-to-dots, pictures, puzzles, seek-and-finds, codes, mazes, word games, hidden pictures and more will appeal to all the children in your classroom. To help you imagine how easy it is to create Sunday school activities about grace from Children's Worship Bulletins, we have included two example activities in this short article. Print the "God loves us" activity page from the Children's Worship Bulletins. Direct the children to complete the "God loves us" activity page. Explain that no matter where we are in the world, God loves each of us. Direct the children to "Turn your activity page over. At the top of the page, write 'God Loves Me!' Next, draw a picture of yourself. When you take your picture home today, tape it to your mirror to remind yourself that God loves you!" Read aloud Ephesians 2:1-10 to reinforce the lesson. Print the "God's gift is His mercy and grace" activity page from the Children's Worship Bulletins. Direct the children to complete the "God's gift is His mercy and grace" activity page. While they are working on the activity page, use masking or painter's tape to mark the starting and finish lines on the floor for a short footrace (Note: This activity works well in a hallway). Then, use the tape to mark a horizontal line on the wall about 6' from the floor. Explain the activities, "We're going to run a race to see which of you is the fastest. Then, we'll see how many of you can jump 6' high." Conduct the foot races, timing each child to determine who is the fastest. When the fastest child has been identified, ask the children to consider who should get the "prize" — the fastest runner, the slowest or someone neither the fastest nor slowest. Note their response. Conduct the jumping test, noting that none of the children could jump 6' high. Ask the children to consider who should get the "prize" because none of them could jump as high as was necessary. Note their response. Ask the children to return to their seats and explain exactly what grace is. The fastest child wouldn't get the "prize" just because he/she won the race. Any child can get the "prize" even though he/she couldn't jump 6' high. Using these examples of who is the fastest and who can jump 6' high, impress upon the children that grace cannot be earned. Put Children's Worship Bulletins to the test by signing up for our 30-day, no obligation trial period, and see for yourself! That's right, for one month you can download and print bulletins to share with your children. At the end of the month, you can either cancel and owe nothing or send in your low payment of $4.99 per age group to continue enjoying all our bulletins! You have NOTHING to lose! 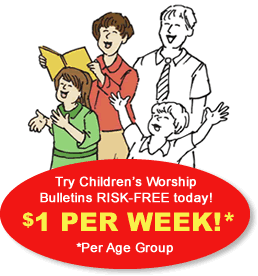 Begin a membership to both age groups of Children's Worship Bulletins today and SAVE UP TO 50% on the second age group. IMMEDIATELY begin engaging your children to worship. They'll thank you! Take advantage of this risk-free offer and Sign up today!